Edo Kiriko is a glass craft that has been handed down in Tokyo. 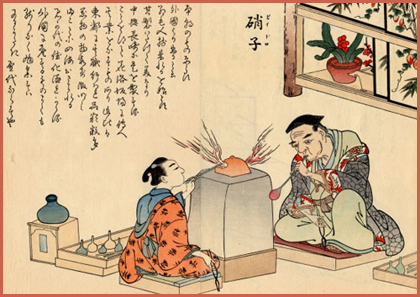 In Edo (present-day Tokyo) in 1824, Kyubei Kagaya started exploring the technique of cutting patterns into the surface of glass. Edo Kiriko was fosterd in the urban culture among the townspeople, and during the Meiji era (mid-19th century), the craft introduced not only Western equipment and instruments, but also their technique while preserving traditional techniques and has been passed down to the present time. First of all, an expert glassblower blows clear glass into a paper-thin shape of colored glass and then rotates this in the air to make the overall form. The result is a two-layer structure with colored glass on the outside and clear glass on the inside. By cutting patterns into the outside surface with different kinds of whetstones, a vivid contrast is created between the colored glass and the transparent glass. 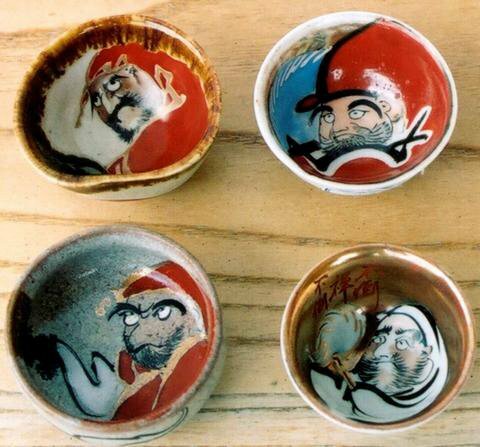 In 1985 Edo Kiriko was designated a Traditional Craft Industry by the Tokyo Metropolitan Government. 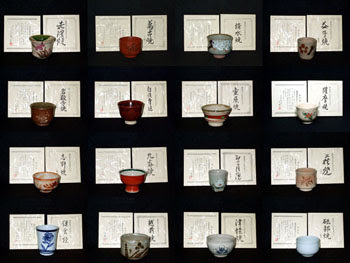 1- Sumitsuke 墨付け (ink application) involves the use of a bamboo stick to apply ink to the surface of glassware. This preparatory process creates a basic outline of the patterns (designs) to be cut in glass. 2- Arazuri 荒摺り (rough grinding) involves the basic grinding of glass in accordance with the pattern applied to the surface using the sumitsuke process. Emery powder 金剛砂 (a grinding agent) is applied to the surface of a metal grinding wheel. This then comes into contact with the glass, and major elements of the pattern are etched accordingly. The next process 三番掛け (Sanbankake) is the application of finer grain emery powder in order to carry out more detailed pattern etching. Depending on designs, three different types of grinding wheel may be used. 3- Ishikake 石掛け (whetstone grinding) involves the use of a whetstone grinder to smooth and better define patterns etched during earlier grinding processes. 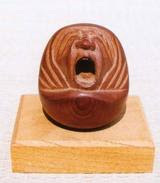 Natural whetstones 丸砥石 from the southern island of Kyushu are used. 4- Kenma 研磨 (or Migaki) is the process of polishing the glass. It involves even finer-detail grinding of those surfaces that are to be non-transparent. It also brings out the traditional luster associated with transparent glass surfaces. When doing this step, polishing powder is used with a wooden polishing wheel 木車（桐、柳） (made of either Paulownia or Willow). 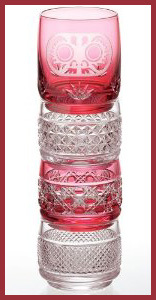 The design is carefully polished in order to heighten both the transparency and luster of the glass. 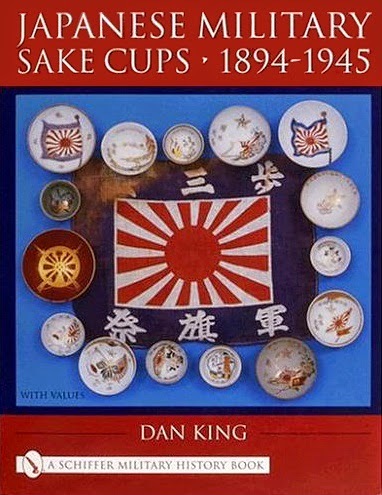 Kiriko is a form of glass cutting in which grinders and whetstones are applied to the surface of glassware, and a number of different cutting (or grinding) techniques are employed in order to manufacture products. The originator of the traditional craft of Edo Kiriko (cut glassware) was Kagaya Kyubei 加賀屋久兵衛, who ran a glassware store in Edo's Odenmacho 大伝馬町 (in the vicinity of modern Nihonbashi). Kyubei is said to have learned his craft in Osaka, which at one stage was a leading center of glassware production in Japan. After completion of his apprenticeship, he returned to Edo and opened a glassware store in the city, where items such as eye glasses, thermometers and hydrometers were produced. 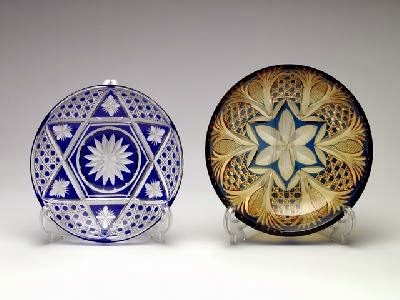 Edo Kiriko techniques deliver exquisite patterns that are both sparkling and lustrous when applied to suitable glassware such as "crystal glass," such techniques delivering products of great intrinsic value. As Japan moved from the Taisho Era to the Showa Era, manufacturing evolved so quickly that "cut glass" came to be synonymous with "artistic glass," with the industry reaching its pre-war zenith around 1940. 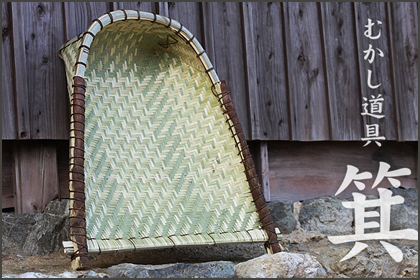 In contemporary times, approximately 80% of Edo Kiriko manufacturing occurs in Koto and Sumida Wards. Concerning Satsuma Kiriko 薩摩切子 (cut glassware produced in Kyushu), which is as equally loved as Edo Kiriko, it resulted from the Satsuma Domain (who ruled over modern Kagoshima Prefecture) inviting the Edo glassware manufacturer, Yotsumoto Kamejiro 四本亀次郎, to establish glassware production in the domain. This industry grew quickly as the government of Satsuma fully supported its development. Molten glass is spooled at the end of a blowpipe and air is blown in by mouth to shape the glass. Glass is spooled at the end of a blowpipe, air is blown into the molten glass as it is held in the air and rotated. Tweezers and other tools are used to make adjustments to the shape. The workpiece is heated in the furnace as shaping operations are repeated. In addition to the steps followed in free-blowing, a wooden or metal mold is used to shape the glass. 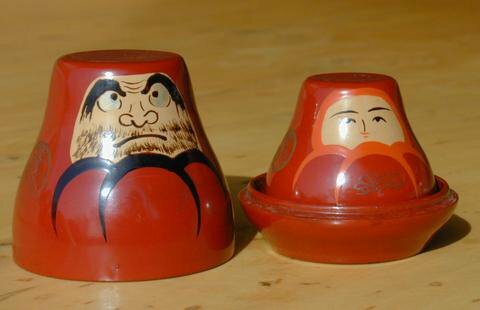 A plunger (male section) and a mold (female section) are created 雄雌の両型. Glass is spooled at the end of a blowpipe and inserted into the mold. The plunger is used to press the glass into the mold and shape it. Silica sand, sodium carbonate, lime, potash, lead oxide, etc. 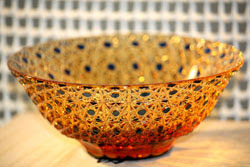 Glass production began in Japan during the Yayoi Period (300 BCE-300 CE). Production was discontinued for a time from the Heian Period (794-1185) to the Muromachi Period (1338-1573), before being revived following the importation of glassmaking technologies from China, Portugal and the Netherlands in the 16th and 17th centuries. 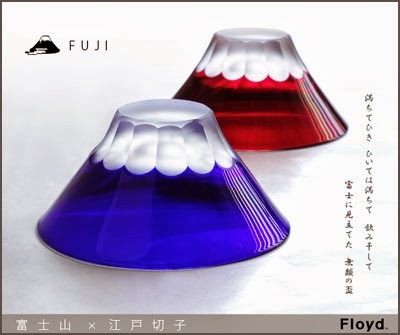 Former names for glass in Japanese (currently garasu or shoshi) include ruri 瑠璃, a Japanese form of lapis lazuli; hari はり from the Chinese word boli; biidoro ビードロ from the Portuguese word vidro; and giyaman ギヤマン from the Dutch word diamant. These names also provide evidence of the overseas links that glass production in Japan enjoys. 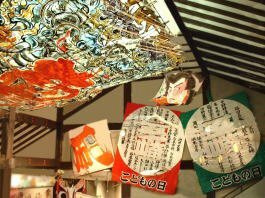 Glass production in Edo is said to have started at the beginning of the 18th century, with items such as mirrors and eyeglasses produced by the first Kagaya (Minagawa) Kyubei 加賀屋（皆川）久兵衛 in the Nihonbashi-Torishiocho neighborhood. Ornamental hairpins and wind chimes were also produced by Kazusaya Tomesaburo 上総屋留三郎 in the Asakusa neighborhood. The names of Kagaya Kyubei and his son Kumasaki Yasutaro 熊崎安太郎 are included in the catalog of exhibits for Japan's First National Industrial Exhibition in 1877. The Tokyo Glass [Hari] Producers Association 東京はり製造人組合 was founded in 1879. 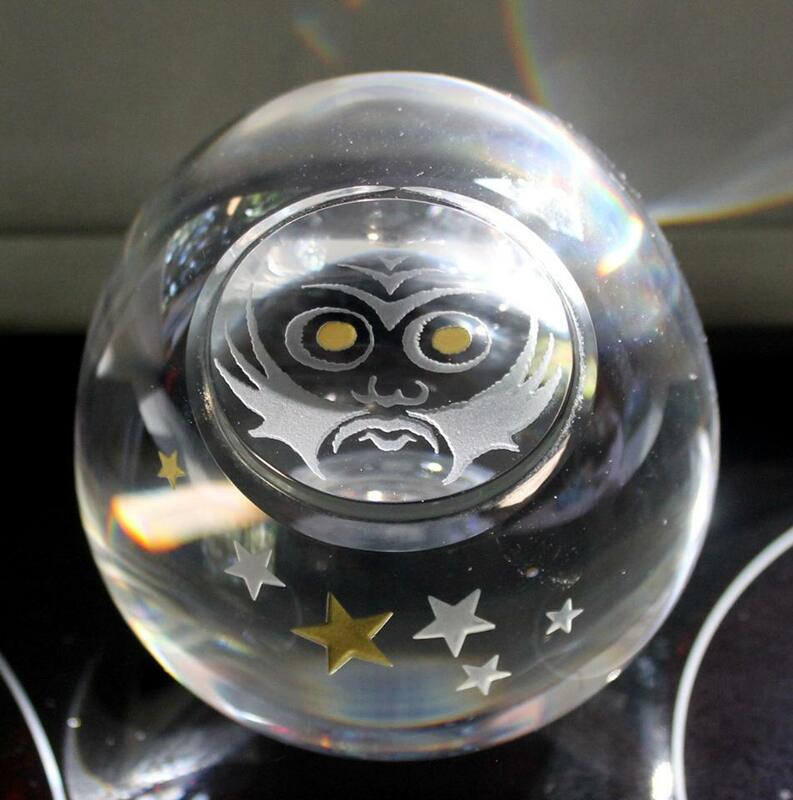 It underwent many changes over time, leading eventually to the establishment of the TOBU Glass Industry Co-operative Association of Japan (TGIA) 社団法人東部硝子工業会 in 1949. The aim of TGIA is to promote friendship, information exchange, communication and coordination among members. Modern glass production was brought to Edo after first passing through Nagasaki, Osaka and Kyoto. 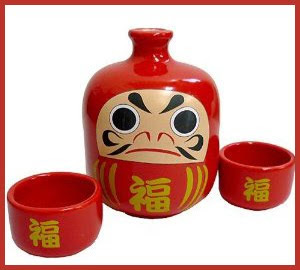 In addition to items such as dishware for everyday use and bottles/jars, scientific instruments such as thermometers and hydrometers were made in response to orders from the scholar and politician Sakuma Shozan 佐久間象山 (1811-1864) as well as other people. During the early Meiji Period, glassmaking developed into one of Tokyo's local industries as modern European methods were integrated and the industry grew to meet a wide range of needs. カガミクリスタル 江戸切子 This apple comes in green, blue and other colors. I'm delighted to find the workshop of Toshio Takizawa, master craftsman of Edo Kiriko, a Japanese style of cut and faceted glass said to date from 1834. 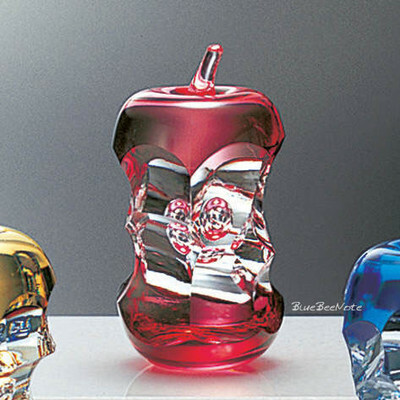 The most popular form now features crystal or clear glass coated with a colored layer on the outside, through which the artisan engraves and facets geometric or freehand designs. Takizawa invites me in, saying, "I entertain visitors and media all the time." ... the Ojima area was once crisscrossed by canals for barges transporting glass and coal. "A lot of glasswork is noisy, and when ordinary residents settled here, they complained about that," he says. "But Edo Kiriko work is relatively quiet, so there are a few of us still around." is a traditional glass handicraft, made in Kagoshima prefecture, Japan. Real Satsuma Kiriko is extremely expesive and rare, because Satsuma kingdom made this glass handicraft, only less than twenty years at the end of Edo Period. Satsuma kingdom is the leading player of Meiji modern revolution, so Japanese people feel the all the romance of Japan's modernization in Satsuma Kiriko. In recent decades, from 1985, Satsuma Kiriko started to be reproduced by its descendants. Some say the sea in Okinawa is rainbow colored. In fact, the sea around the southern islands has many colors: deep blue, sky blue, emerald green, orange and yellow at sunrise and sunset etc. 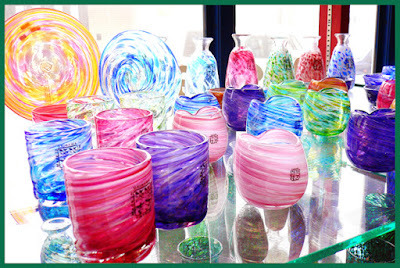 Ryukyu Glass may have inherited its qualities from the colorful and calm sea of Okinawa. 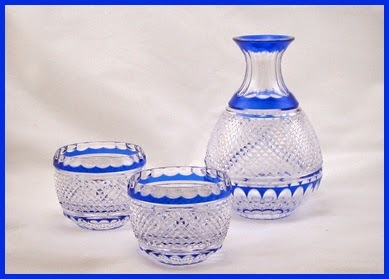 Glassware was originally brought to Okinawa from Southeast Asia and the Strait of Malacca several centuries ago. However, its production did not begin until the 19th century. Glassware was easily broken during the long ship voyages from overseas, which led the people of Okinawa to invite glass craftsmen from Nagasaki or Osaka to their land so they could learn how to make medicine bottles and lamps for themselves. They also used all kinds of recycled glass, like broken glass pieces from foreign ships, used sake and soy sauce bottles. They also made use of inferior products like air bubbled or unevenly thickened glass. These factors all contributed to the unique design of Ryukyu glass. In 1972, the Okinawa Ocean Expo was held, igniting tourism in Okinawa. The more tourists visited the islands, the more souvenirs were sold. 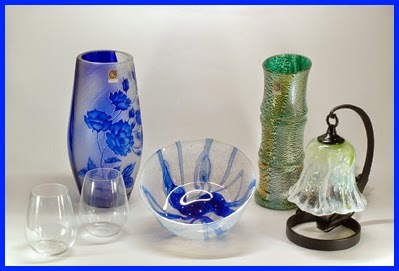 In response to these happenings, local glassmakers started expanding their industry; they introduced new glass materials in addition to the traditional recycled glass, and developed new techniques for coloring. 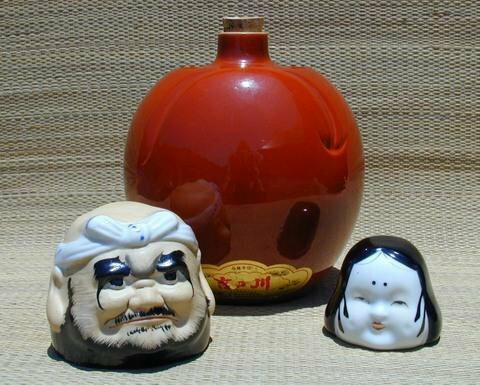 In 1998, Ryukyu Glass was registered as one of the Traditional Crafts of Japan. 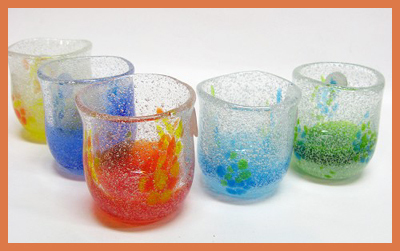 There are many glassmakers in Okinawa producing many kinds of glassware, from artistic pieces to gift items. Don’t waste, recycle. Be flexible and adaptable. And most importantly, every imperfection is useful.
. Ryuukyuu 琉球 Ryukyu art and craft, Okinawa .
. Tsugaru Glas 津軽のガラス工芸 - Aomori .
. Matsugaoka Glass Products / 松ヶ岡ガラス工業 - Yamagata . Making glass items had been introduced in the Heian period, but was soon forgotten. In the middle of the Edo period, things made of glass have become quite popular, from Kanzashi hairpins to cups and plates. All the glass items were blown from a round piece (tama　玉). It was then blown into shape.
. Fuji San 富士山　Mount Fuji .
. Edo shokunin 江戸職人 craftsmen - ABC list . Flying a kite is a popular event during the three days of New Year Holidays. There are also contests of Kite flying in Hamamatsu and other cities. Some kites are so big it takes a whole group of grown up men to hold them. 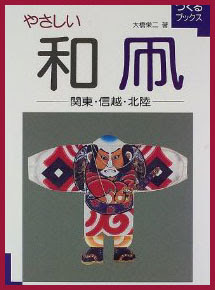 The patterns of Japanese Kites are sometimes very beautiful, heroes of legends and folktales are most spectacular. To find out about them is like an excursion in the stormy field of Japanese Samurai Heroes. 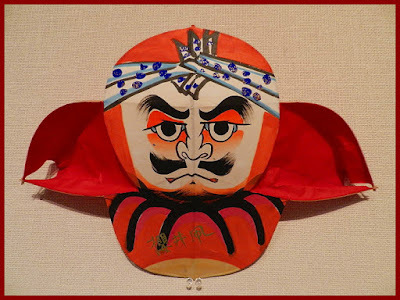 But the diligent Daruma san has also won his place in this genre.
. Edodako, Edo-dako 江戸凧 Kites of Edo .
. Kanagawa 神奈川　three kites .
. Kyushu　九州　kites from Kyushu .
. toojindako, toojin tako 唐人凧 kite with Chinese face . Click on the buttons to see the various kites. 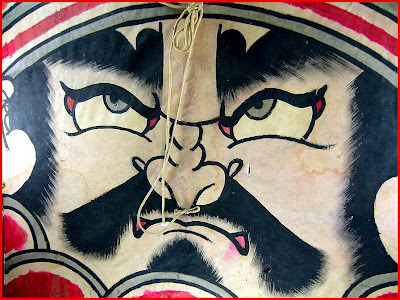 Daruma as protector of the silk cocoons.
. Kites from Kanagawa 神奈川の凧　. A kite with six corners. 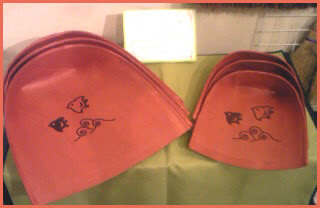 with more Daruma kites !
. Folk Toys from Toyama (Etchu) . A long single tail is needed to fly this kite. The birth of this kite is Hatano city, Kanagawa prefecture. About 115 cm long and 90 cm wide. common forms are fukusuke, horsefly, bee, butterfly and Tenjin sama. They are known for their bright colors. 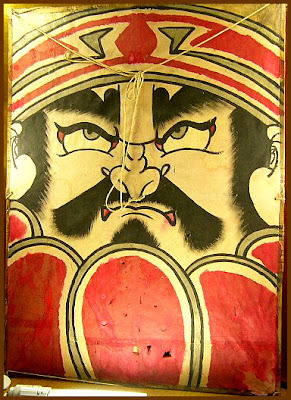 They are "sodedako" 袖凧　kites with sleeves.
. Aichi Folk Art - 愛知県　. In the town of Kurayoshi, Tottori, the kites are not called TAKO (Octopus), but IKA (Squid).
. ikanobori いかのぼり - 凧 -紙鳶 kite like a squid . A child or child with parent is out flying a large kite in the spring wind. As Buson or his persona watches from a place that has clear landmarks around it, he experiences an uncanny feeling when he realizes the kite is flying in the same part of the sky where he saw another kite flying yesterday. The open expanse of the sky seems to lead his consciousness to expand and oscillate back and forth between the present and the day before until linear time begins to recede and time becomes spatialized -- as open and borderless as the sky. This seems to be a kind of eternal moment in which he sees yesterday's and today's skies together as non-dual. 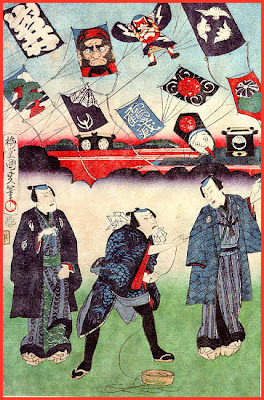 In Japanese, kinō, "yesterday," sometimes has the same open-ended meaning of "in the past" that the English word has, and many Japanese readers feel Buson in this moment of time out of time concretely feels or oscillates between the present and the remembered time of his childhood, when as a boy he watched a high-flying kite in the very same part of the "same" sky. The barely visible cord or string of the kite thus suggests the thread of memory that allows humans to feel they have a continuous identity and a linear life constructed of days and months and years, and it this cord seems to imply that humans can sometimes travel forward and backward in life narratives that are circular, like the sky. Buson compared haikai history to a great circle in the preface to one of his renku collections, and he was surely familiar with the various circles drawn by zen calligraphers and painters, so I think this hokku is also setting up an oscillation between linear and circular or spherical time in general, as if we could have memories of the future. For example, perhaps Buson feels at this moment that he could already partially glimpse himself as he is now when he was a boy looking up at a kite. 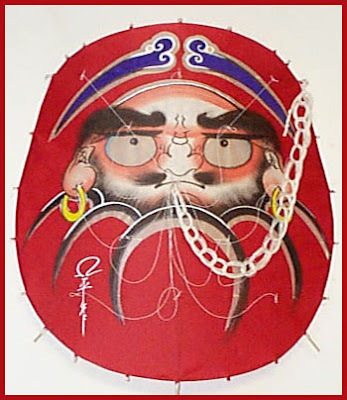 Since hokku (and painting) seem to give Buson access to spherical time, perhaps the kite in this hokku also suggests a hokku tethered to grammar and ordinary reference but flying beyond them and suggesting things in timeless time. Perhaps this is why Japanese critics often refer to this hokku as evoking an experience of eternity. 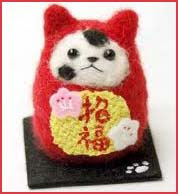 ikanobori 几巾 is a kigo for the New Year. Ikanobori 紙鳶. This means "kite", and don't let the straight-from-Chinese kanji spelling ("paper hawk") fool you: the etymology is "squid streamer." But wait — Wasn't the Japanese word for "kite" actually tako, homophonous with and probably deriving from the word for "octopus"? Turns out that tako is the Edo word for "kite", and up until the great linguistic levelling of the Meiji period the Kansai area used ika[nobori]. The Nihon kokugo daijiten points out that in the deep north and far west, there's still another family of words in use, based on the root hata (perhaps related to hata meaning "loom"?). So the "center and periphery" model of language change would suggest that hata was the original word, later supplanted by tako, itself later replaced by ika (at least in the Kansai region — presumably the center shifted to Edo before the word was able to fully propagate, Maeda Isamu 前田勇's Edo-go no jiten (江戸語の辞典, "Dictionary of Edoese") has an entry for ikanobori, but calls it a loan (着用語) from the Kansai area (上方). 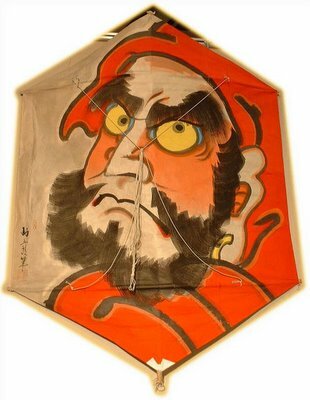 Of course, the real story is probably more complicated than a simple wave-based model, but it seems that kites simply weren't mentioned in much writing between the Heian and Edo periods, and evidence is scarce. Makimura Shiyō 牧村史陽's Ōsaka kotoba jiten (大阪ことば事典, "Encyclopedia of Osakan dialect/words") has what looks like a pretty thorough if (understandably) Ōsaka-centric review of what historical evidence exists in its ikanobori entry. A Famous Buson Haiku: Is It ‘Kite’ or ‘Kites’? One of the peculiarities of the Japanese language is that while it’s does have a plural form for nouns it almost never gets used, mainly because the context that speaker is in dictates if they mean more than one of something. This gets a little tricky when it comes to reading haiku because the reader isn’t in the same physically present context as the speaker. . . . . . 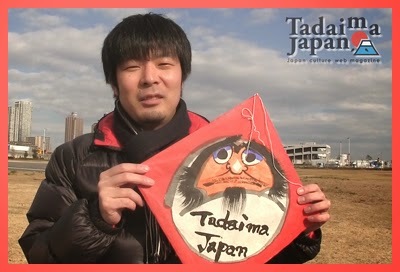 Finally I want to introduce the kites of Mr. Hideo Asami. I met him at an exhibition in a store in Okayama City in 2001 and bought three kites all at once. 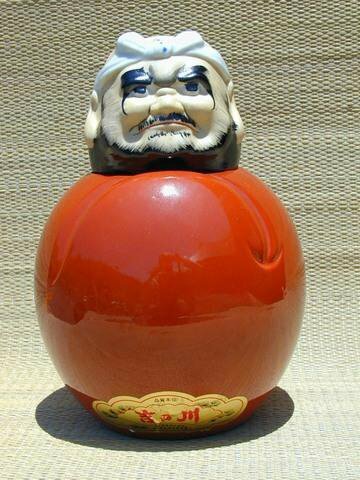 Mr. Asami is very good with the brush, as you can see from the circle below the BIG Daruma kite. But what impressed me most was the writing of a special kite for my husband, rendering his name Bernard into "Beru (a bell) Naru (ringing) Doo (way)" , which he choose to write in chinese characters, making up a special version of the BELL part with a little bell instead of the strokes that belong here! My next best favourite is the BIG White, as I call him. 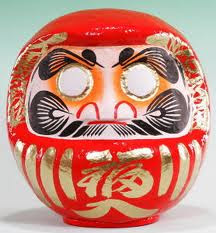 He hangs in our Daruma Hall as if he was ment to be there. 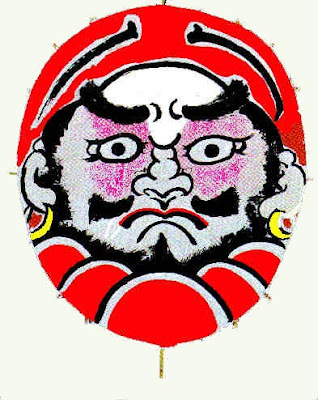 He is full of symbols of good luck: This very special kite has the most lucky charms on one figure (fuku o maneku Daruma Tako 招幸の達磨凧): The headband is in form of a pair of crossed herons, symbol for good marriage. 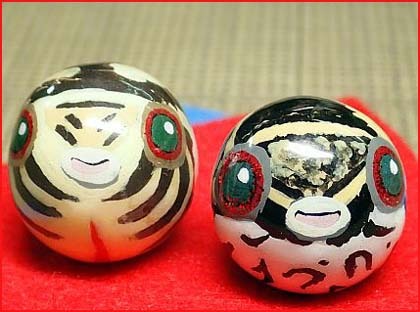 The eyes in form of plover birds (chidori 千鳥), put on with wax to be shining. The chidori-form means your wish will be granted. 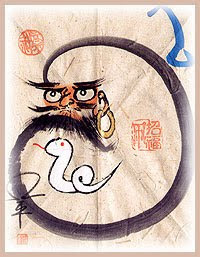 The nose in form of the chinese character "To be happy" (yorokobu 喜). The ears in form of a gourd, with the Sanskrit characters for "A" and "Om", Beginning and End of all Things, on each. Symbol for a student who is studying all his life. The beard painted strongly, symbol of good health. The belly in form of mountains with the size of 7 5 3 (shichi go san 七五三), a lucky number for healthy children. 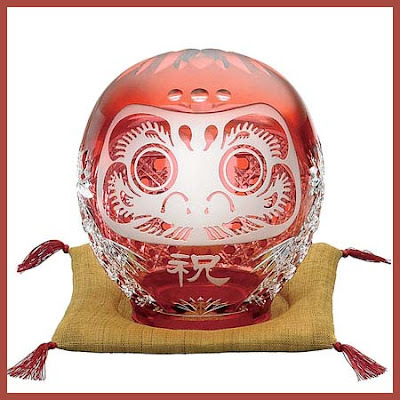 General form of a rounded egg, since old times a symbol for good luck. Red color wards away bad luck, yellow brings money, purple expresses dignigty and the slightly pink face shows strong will. There is a 凧屋の八兵衛 Kite Shop run by Hachibei. When he went to get a bride, he came to a ghost house. At night he saw a light in the garden and wanted to flee, but his new bride told him that this was the hiding place of a golden stone (kin no ishi 金の石). 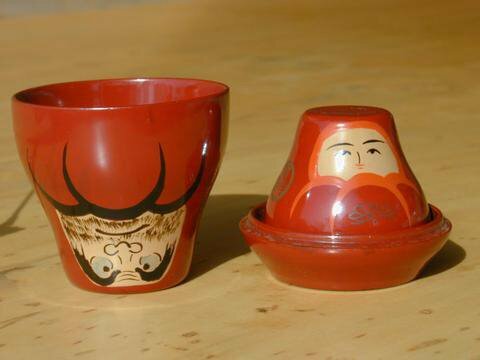 Next morning he dug in the garden and found a golden cup under the stone. Soon he was the richest man in the village. When children want to fly a kite (called 凧（いか） IKA in Osaka) and there is no wind, they call for a Tengu to help. Tengu san, please send us wind. If it is too much, we send it back. Tengu san, please send us much more wind. If it is too much, we send it back. 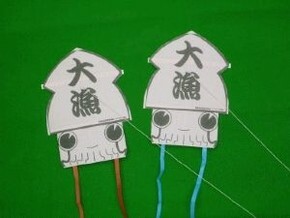 there is a takokai 凧怪 "kite monster". It comes out during daytime, looking like a normal kite, but then comes closer and bites people. It has a face painted on it, but in fact, it is a Yokai monster. toppuutako 突風凧 "strong wind kite". It comes out during a typhoon and blows around like a whirlwind and causes much damage. This kite is made in memory of the great straw sandal from Mount Haguro. 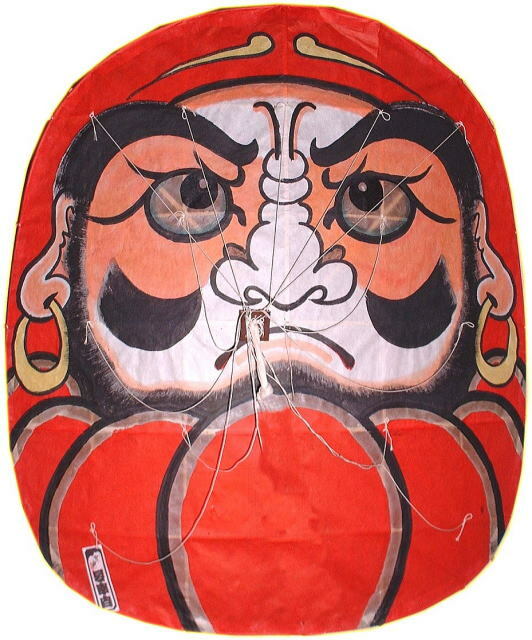 It is about 1 meter long and is used during the New Year celebrations.
. tako 凧 kite .